In Portugal, the April 1974 Revolution worked as an explosion of wills, claims and manifestations and in that sense it was favorable to the happening of punk in Portugal. In the city of Lisbon, small youth groups were in touch with the international news (albums, clothes, bands, magazines...amp;). The desire to be punk born within those groups, unlike the commonly accepted notion that punk emerged spontaneously from the rage of the working class against the system. An idea defended by Hebdige (1979) or Albiez (2004) was that punk started from a conception slowly built and developed by a heterogeneous group of radicals, art students, working and middle class musicians and journalists bored with what rock became. Being a too-much complex movement to be understood through one-way explanations attached to the social classes in a more traditional sense. Despite the importance of the April 1974 Revolution, it was dificult the entrance of punk in portuguese society. Thus, only in December 1977, António Sérgio marked the release of the first punk single pressed in Portugal in Música & Som (a portuguese magazine) of that month. In February 1978 it was performed the "first evening" punk in Lisbon, in Archote Club in Arco do Cego. It was an organization of António Sérgio, Joaquim Lopes and José Guerra with commented passages of multiple albums of british, american and french punk rock bands. In this first public event of punk, there was playing music, but still no gigs of bands. The first reports on portuguese punk band gigs date back to 1978: in May and June in Música & Som (gigs of Faíscas in the pavilion of Os Belenenses and of Aqui d'El Rock in Clube Atlético of Campo de Ourique); in June in the journal Pop Clube (where Aqui d'El Rock and Faíscas were cover); and in July of that year in the magazine Rock em Portugal. Therefore punk was launched in Portugal. Not being properly a movement, the first punk groups appeared in the final years of the 1970s b Aqui dbEl Rock, Faíscas, UHF, Xutos & Pontapés, Minas & Armadilhas, Raios e Coriscos - in these scarce events, showing great vivacity and mobilization of actors and followers; clear examples of outbreaks of change and penetration of punk and its policies in Portugal. A huge part of the protagonists of the Portuguese punk recognizes the Aqui D'El Rock as the founding fathers, as they were an iconic band in the punk emergence. 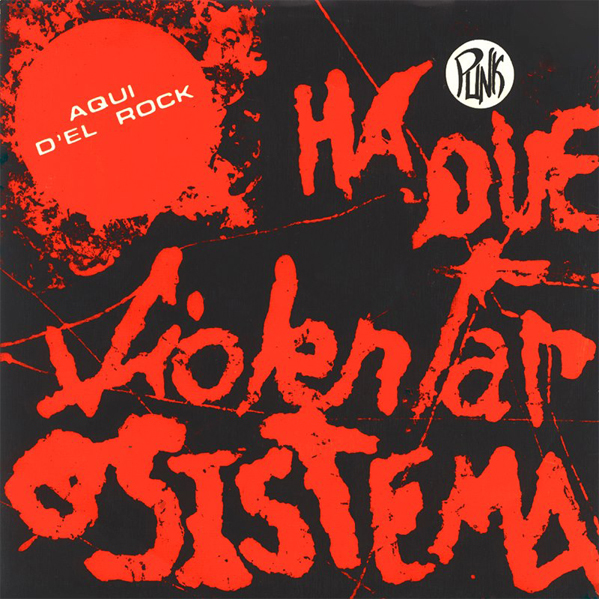 The recording of two singles in the late-1970s materializes the existence of Aqui D'El Rock, and that may help us understand their historical importance in relation to other bands from the same time - Há que violentar o sistema/ Quero Tudo (1978) and Eu não sei/ Dedicada (a quem nos rouba) (1979). Making a workup approach, we can locate the Portuguese punk in a global context, emphasizing its specificities arising from its appropriation in a non-Anglo-Saxon context and in a society located in southern Europe. Especially in Lisbon, at the beginning, and later (mid-1980s) in Porto and Aveiro, punk appeared in Portugal with bands, gigs, fans, fanzines, scenes. It was not so much a new sound, but a new form of identity expression in the face of society, to politics, norms and values, grounded in resistance, in criticism and rejection of the system. It is still important to remember the fact that almost all of the punk bands express themselves in Portuguese until the mid 1990s. This is equally relevant today, since approximately 65% of the bands express themselves in Portuguese, contrary to what happens in some countries outside the Anglo-Saxon world, such as Eastern European countries. Important about Portuguese punk relates to the fact that punk itself has been the most visible face of the cosmopolitan and artistic rituals of youth culture in Portugal in the first half of the 1980s by the consumption of symbolic and aesthetic goods, but also by the creation of an artistic and urban atmosphere that crossed the night, fashion, cinema, video, music, visual arts...amp; At this time, and especially in Lisbon, many crossovers have been established between punk and new wave and post-punk. "The thousands of participants in the twenty-fifth anniversary of Rock and Roll, held at the Sociedade Os Alunos de Apolo on the 12th, cried and gnashed his teeth with the fury of punk wave that distorted the sounds. (...amp;) I gone out at three in the morning and I did not know: 1) If the punks will broke totally the furniture; 2) If the neighborhood won't sleep; 3) If the Board of the Company was able to maintain cold blood with the provocations that were directed to them." In April 1979, another iconic concert and founder occurs at the high school D. Pedro V. The report of this concert encouraged Pedro Ferreira to the following comment, in May edition of Música & Som: "Some people do not take seriously the punk phenomenon. The recent gig at the high school D. Pedro V, in Lisbon, has again concerned that attitude. Punk has a vitality of its own, as it's evidenced by the emergence of new (few, unfortunately) groups as the Raios e Coriscos, Minas & Armadilhas SARL and Xutos e Pontapés, who acted in conjunction with Aqui d'El Rock at mentioned high school. (...) Returning to the concert, it was meaningful one of the true rebels has lost the microphone to give a shout out; the common denominator of these people was the scream "we are alive". But the communication between the group on the dais and the audience was unequivocal, because the hazy and overwhelming sound turned off the contestation, pluralism, and, at the same time, was creating a timeless atmosphere of the miracle: the cigarette that is asked, the beer you drink, the your eyes in my eyes ...affective miracle, another communication between individuals floating in the clouds of friend noise, miracle musically passive, miracle on the surface ...amp; Punk on the surface of the miracle!" It is from here, and from these two years of achievements, that punk in Portugal won your space, opening the way for the first foreign gigs of punk bands in Portugal (the Ramones gig in 1980 it's an example) and a route marked by ups and downs and by constant metamorphosis, showing a local re-appropriation of global punk. This leads us to two primary considerations: punk rock is a meaningful example of cultural hybridism, because it is not the same everywhere; it is shaped and redefined locally, according to the resources and social and political needs of those places, in a process that mixes characteristics of the global punk and local features. The same idea is underlined by Alan O'Connor (2003: 53) that admits that it is possible to talk about global social movements with a common ground but with different organizations, both historically and socially. Therefore, if it is in the dualism between the US and the UK and the "cultural syncretism" that is the punk's inception (Lentini, 2003: 154), in Portugal we can also observe this genesis. Punk's emergence in Portugal is, therefore, shaped by an openness and changing climate coming from the revolutionary period and molded by a mimesis/appropriation of the British and American realities; mimesis that is not only shown by the fathers of the Portuguese punk but also easily found throughout its several generations. Still about the beginning of the Portuguese punk, one can say that in everything between forming bands and giving concerts, the Do It Yourself (DIY) logic is a fact. There was a shared structure, built by them only. That is, in fact, a sine qua non condition for punk to exist. The DIY promotes the music creation and local initiatives and rises, in a first moment, as an alternative to mainstream music and, in a secondary moment, as a way for the social actors to show their total opposition towards the major music labels that only were concerned with profit and dictated the (non-existent) musical diversity, as well as the ways in which one could edit and talk about music (Mattson, 2001: 72-73). Actually this DIY ethos works with particular intensity in the drive of strong familiarity networks and mutual inter-knowledge among Portuguese punks: what is influenced by the small size of the country. Therefore, this informal relational capital will provide conditions for the perpetuation of the DIY ethos by allowing mutual aid in issues such as instruments, transport, light and sound, rehearsal's rooms, show rooms...amp; The uniqueness of the Portuguese punk scene is also energized by the vibrancy and advocacy of underground. Thus, punk bands which have an established position in the Portuguese punk scene are rare and object of intense criticism; the Portuguese punk never met marketing processes of masses, and (past nearly four decades) it remains in a objective and subjective claim of fight against system, or as António Sérgio would said, "by the right to difference". ANA OLIVEIRA: BA Hons. in Sociology (University of Porto) with the thesis «Cultures Territory: design of an "emerging cultural cluster" in downtown Porto», Ana Oliveira has an avid interest to know better themes such as youth cultures, popular music, sociology of culture, sociology of art, sociology of music, identity and lifestyles, urban space appropriation. In 2011 Ana studied the music nights of Porto and Lisbon, as well as the music summer festivals between 2007 and 2010. Currently, Ana is a researcher at the scientific project Keep it simple, make it fast! (PTDC/CS-SOC/118830/2010).